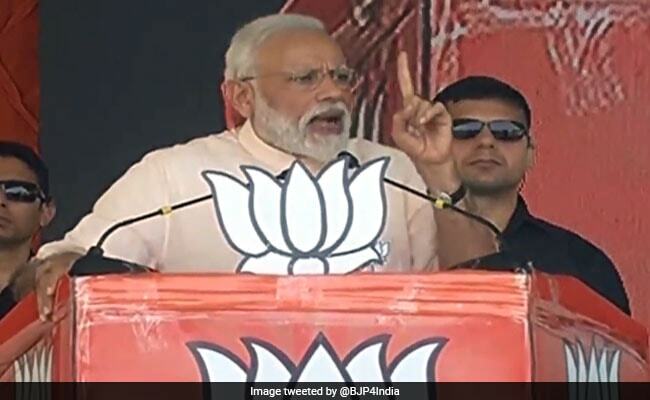 Criticising the Congress for promising to amend the Armed Forces (Special Powers) Act (AFSPA), PM Modi said such statements by the party will encourage terrorists and those sitting in Pakistan. Prime Minister Narendra Modi on Wednesday came down heavily on Congress party accusing it of "being soft" on terrorism in order to appease its vote bank and claimed the party is "openly supporting" terrorists and separatists in its greed to come back to power. "Congress has always bowed its head before terrorism due to its policy of appeasement and to satisfy its vote bank. It has been soft on terrorism. Do you remember who abolished the Terrorist and Disruptive Activities Prevention (TADA) Act? It was Congress. Remember, Congress always made false promises in the name of taking action against the terrorists and Maoists," PM Modi said during his public rally in Kolkata's Brigade Parade Ground. "Now they are openly supporting terrorists and separatists in the greed of ascending to power. Trinamool Congress, which emerged from Congress is also party to this crime," he said standing at Trinamool Congress supremo Mamata Banerjee's home turf. "Congress is making statements which will help and encourage the terrorists sitting in Pakistan. Why is Congress toying with country's security and creating unrest like this? As soon as I started using the word 'Chowkidar', some leaders in Congress got angry with all the 'Chowkidars'. That's why they are taking such steps against the Army," he alleged. He said the Congress manifesto has come out with a "prefixed expiry date" of May 23, when the results of the 2019 Lok Sabha polls will be announced. "Congress will go down and so will their manifesto. People have already given it their stamp," he said. Referring to himself as the 'Chowkidar', the Prime Minister asserted that he is standing like a wall between the Congress' manifesto and the nation's security and vowed to not let the "conspiracies" by the Congress succeed. Taking a swipe at the former UPA government, PM Modi said it is not that the country's armed forces did not have the expertise to conduct surgical strike or airstrike earlier, but the then government lacked "will power and strength". "Tell me who was asking for the proof of airstrike? Who doubted it? Who was demoralising the Army? Who wanted to see the dead bodies of the terrorists? Who committed the crime of asking for evidence from our soldiers? Is it not an insult to the slain soldiers in Pulwama?" he asked the crowd. "Our Army had the capacity to conduct airstrike and surgical strike since long. Our scientist had the expertise to destroy satellites in the space from before. But what was lacking was the willingness and strength of the previous governments," he added.